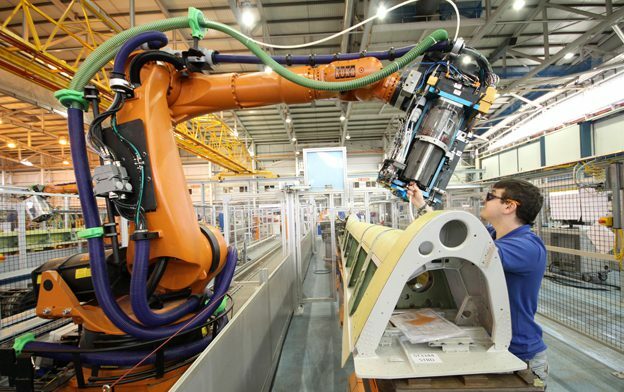 Scotland’s national centre for advanced manufacturing has the ‘perfect home’ in Renfrewshire, according to Renfrewshire Council Leader Iain Nicolson. Councillor Nicolson was welcoming the Scottish Government announcement today that the National Manufacturing Institute for Scotland (NMIS) will be established on Abbotsinch Road, next to Glasgow Airport. Work to build the £65million industry-led Institute will start in 2018 with the University of Strathclyde as the anchor university and is expected to be the catalyst for thousands of jobs. It will be the anchor tenant of a new 130-acre business and manufacturing district being developed around Glasgow Airport. The enabling infrastructure of roads, bridges, cycleways and pedestrian routes are being delivered by Renfrewshire Council through the £39.1million Glasgow Airport Investment Area project, funded through the Glasgow City Region City Deal. “Renfrewshire is the perfect home for Scotland’s national manufacturing institute and I am delighted that it will be established here,” said Councillor Nicolson. “We offer the right environment for it to flourish, with a strong manufacturing base and highly skilled workforce already in place, complemented by the excellent research expertise across the region. The Institute is a collaborative project between the Scottish Government, Scottish Enterprise, Highlands and Islands Enterprise, Skills Development Scotland, the Scottish Funding Council, University of Strathclyde and Renfrewshire Council. It aims to make Scotland a global leader in advanced manufacturing, combining research, industry and public sector expertise to transform skills, productivity and innovation in a sector which already accounts for half of Scotland’s international exports. Manufacturers in Scotland and worldwide will be able to access the Institute’s services through virtual reality technology. There will also be a skills academy to enable manufacturing staff to keep up-to-date with new tools and techniques and the Institute will act as a ‘shop front’ inspiring the next generation of engineers and innovators. This announcement builds on the development of the £8.9million Lightweight Manufacturing Centre which will open in May 2018 at the Doosan Babcock site in Westway, Renfrew, developing new manufacturing processes for lightweight materials for the aerospace and automotive industries. Councillor Nicolson added: “Renfrewshire has long been renowned for its manufacturing exports, not least giving Paisley Pattern to the world, and I am excited about the prospect of helping to play our part in making Scotland a global leader in advanced manufacturing. “This is an exciting time as we put in place the infrastructure and investment which connects communities, creates jobs and delivers a thriving Renfrewshire.